Nyami Booi, Ayanda Dlodlo in breach of ethics code - SABC News - Breaking news, special reports, world, business, sport coverage of all South African current events. Africa's news leader. 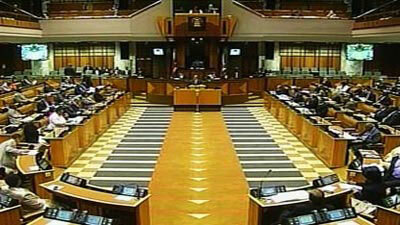 Parliament's to reprimand two African National Congress MPs. Parliament’s Joint Ethics and Members Interest Committee has issued recommendations for tough sanctions against two African National Congress (ANC) MPs. It has recommended that Nyami Booi‘s salary be docked for 45 days after he breached the code of ethics for not declaring that he received a monthly salary of R60 000 for additional work since December 2015. This is revealed in a committee report. The complaint was lodged in May 2017 by Democratic Alliance MP, James Lorimer. In terms of the Committee report, Lorimer provided the committee with a copy on an agreement between Booi and a company called Lurco Coal. The agreement revealed that Booi would act as a consultant for Lurco on among other things an ad hoc basis. Lorimer alleged that Lurco entered into a contract with Eskom. He then alleged that Booi breached the Code of ethics because Parliament did not give approval for him to do remunerative work outside of Parliament. Following an investigation, Booi admitted that it was an oversight on his part. The committee has now recommended that Booi should be reprimanded in the National Assembly. He will also be given an fine which is equal to 45 days’ salary. It also recommended a sanction against Public Services and Administration Minister and ANC MP, Ayanda Dlodlo, for breaching Parliament code of ethics after she failed to declare that she stayed at Oberoi Hotel in Dubai paid for by controversial businessman Fana Hlongwane. Reports at the time said a Gupta company had booked the accommodation and Hlongwane had paid. Dlodlo will face a sanction which still requires the final approval of by the National Assembly. The complaint against Dlodlo was laid by DA MP, Phumzile van Dame, in June 2017. The revelation that Dlodlo breached the code of ethics and the disclosure of members interests was sparked by newspaper article in June last year. Van Damme subsequently alleged that Dlodlo failed to disclose that she stayed at the Dubai Hotel paid for by Hlongwane. Following an investigation by the Joint Ethics Committee and Members Interest, it recommended that Dlodlo be reprimanded publicly in the National Assembly, ordered to rectify the breach and to be counselled on the requirements of the code. Minister Dlodlo has since accepted the ethics committee outcome. In a statement the minister noted the outcome of the ethics committee regarding her non-disclosure of details pertaining to a 2016 trip. “As the record will show, I have been fully transparent and truthful about my trip and the fact that Mr Hlongwane paid for my accommodation”. Says the Minister, “It was my own admission that served as the basis from which Honourable Van Damme submitted a request to the ethics committee to investigate. This entry was posted on 11 Mar 2019,04:11PM at 4:11 PM and is filed under Politics, News, Homepage Latest Stories Slider. You can follow any responses to this entry through the RSS 2.0 feed. Both comments and pings are currently closed.